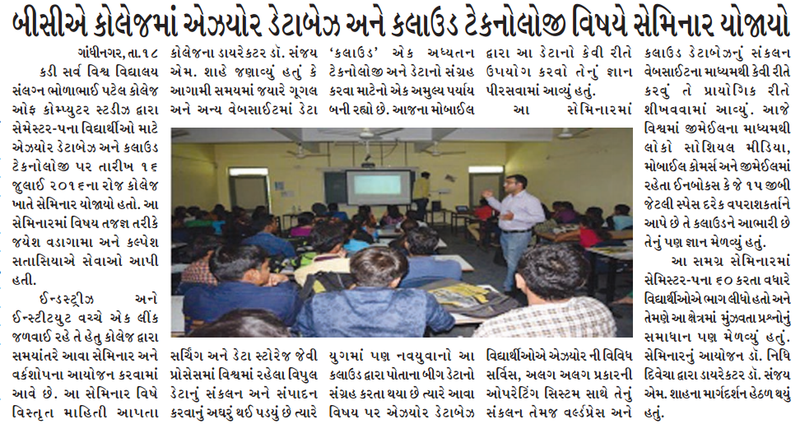 I have taken session on Azure cloud technology at SK Patel Institutes of Computer Studies. It was a good experience to share knowledge with student at college level. BCA Students also very existed to learn Microsoft Azure cloud technology. Also solved student queries about Azure and other technologies related. College has published Microsoft Azure related session information on news paper. Some random pictures during the session. Special thanks to Mr. Jalpesh Vadgama and I inspired from him. Thanks to Dr. Nidhi Divecha and Dr. Sanjay M. Shah. Who has given such opportunity to share our knowledge with students.